Now that album 2 is completed we’re going to be getting out and about and playing the new songs!! So we’ve laid down all the tracks, been singing our lungs out and put the final bits down to The Protester and Butterfly Effect!! 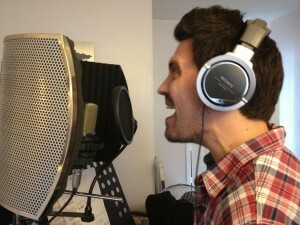 They’re sounding awesome and we can’t wait for you all to hear the finished versions. Off now to start thinking about the artwork for album 2! 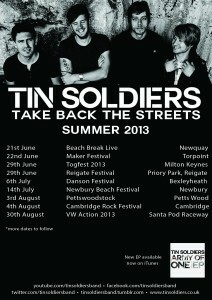 Tin Soldiers – In the studio! We’re back at Outhouse finishing off the last tracks to album 2! Very exciting Cialis Online. 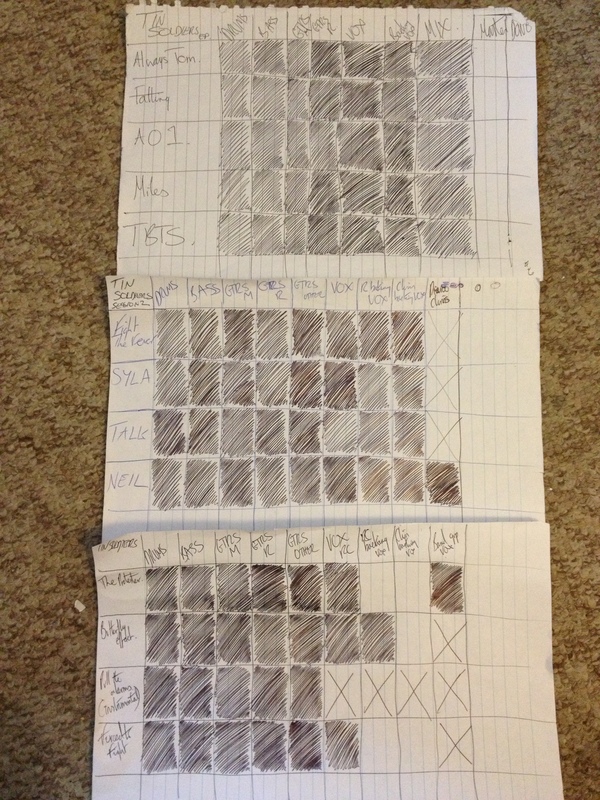 By next week we should have all of album 2 recorded!! We’ve had some great reviews for our Army of One EP! 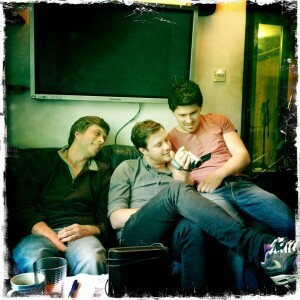 New four piece band who are busy working on their second album, after their 2010 debut album ?Telling Tales? gained glowing reviews. After listening to this four song EP you can see why as they have big, hooked filled rockers like ‘Always Tomorrow’ and a mellower sound on ‘Take Back The Streets’, sounding a bit like Feeder meets the Killers.They make the power pop/rock genre seem easy when often it is one of the hardest sounds to crack. Often bands don’t always live up to second albums as many good ideas get used up on the debut (the Darkness being a classic case in point) but based on these four songs we can expect a storming album from Tin Soldiers next year. “Guitar groups are on the way out,” as The Beatles were once told following their audition for Decca in 1962. Similar rumours of Rock’s demise have abounded over the years, and if the charts of late have been anything to go by (which they usually aren’t), you’d be forgiven for thinking that the rumours were finally true, albeit sixty years later. So isn’t it about time that a new band came along and shook things up a little to prove the naysayers wrong…? 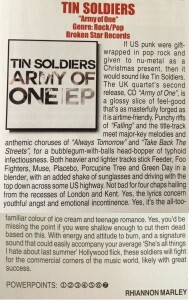 Enter Tin Soldiers, a tight-knit four-piece from Kent, whose newest foray into the world of Pop Rock, Army Of One, sees the light of day this month. With a standard guitar band setup, Rich Cross and Matt Wade on guitar and vocals, Matt Jennings on bass and Chris Persiva on drums, they make no bones about their Britrock roots. The EP opens with the tumultuous Falling, which showcases the band’s tight musicianship, and their ability to write a catchy melody, then dress it up in all its rock finery. There’s a great energy here, not far from that supplied by The Cooper Temple Clause some years back. Always Tomorrow is a quieter affair to start with, more like Feeder than the Foos, but no less well-crafted. The catchy melody and tight rhythm beg to be included on radio playlists everywhere, and certainly has the potential to trouble the charts. The title track, Army of One returns to heavier territory. With its fuzzy bass and staccato guitars, the band could easily have taken their foot off the melodic pedal, but no – you’ll be humming the chorus for days. Finally, Take Back The Streets sees Rich Cross in his best vocal form with yet another singalong chorus. Good use of melody isn’t restricted to the vox either; the middle section contains a gem of a bassline, supplemented by arpeggiated guitars that harken back to The Edge at his noisy best. As an EP, Army Of One is a selection of bold, melody-driven anthems, well worthy of further investigation. 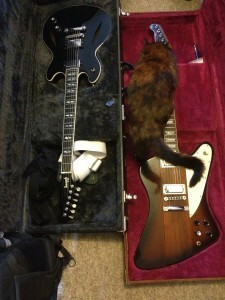 The boys have the good sense to vary the guitar sounds throughout, and the bass refuses to play a backseat role either. Married with plenty of thundering toms, and you’re on to a winner from the start. The production is crisp, the sound separation allows all the instruments to be heard without losing the vigour that’s essential in any rock tune. Just a bit more beef in one or two of the drum sounds and this would be nigh-on perfect. Pop music has been around for around about 60 years now; music hall and folk before that have been around even longer. In such a space of time, you might think we’d have moved on from lyrics agonising about relationships to broader themes: the Large Hadron Collider for example, a three and a half minute assessment of the Newport Pagnell Services maybe. Or perhaps a helpful ditty to help you conjugate your Latin verbs. 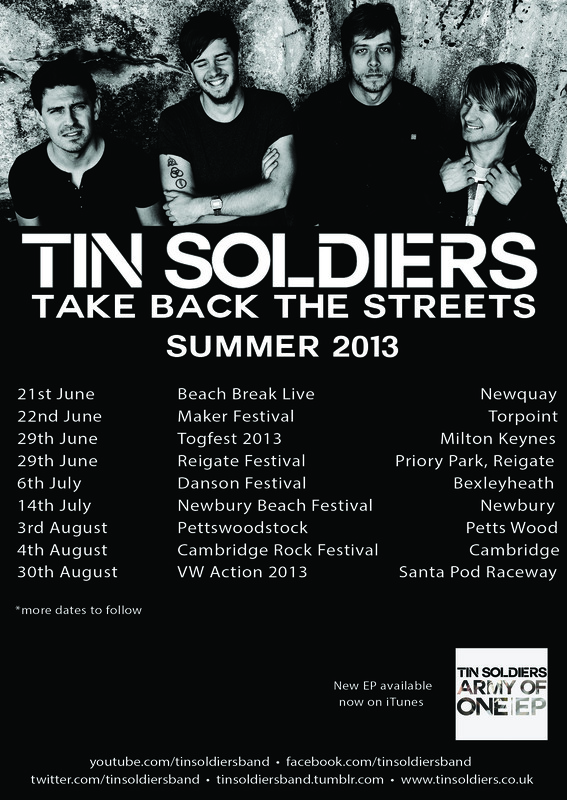 Which brings us neatly to Tin Soldiers, a band of heavy rocking infantrymen we first came across last year when they released their album, ‘Telling Tales’. Now, they are back with a single (‘Always Tomorrow’) and an EP featuring that very song along with three other tunes. The EP is very much concerned with matters of the heart. ‘Falling’ is about the surge of confused emotions experienced at the start of a relationship (‘now I guess this is an undying love for you’) while ‘Army of One’ mirrors this with the confused feelings encountered at a relationship’s end (‘you’re not the one/just one of many’). Elsewhere, single ‘Always Tomorrow’ is about a stage somewhere in between: trying to make things work (‘there’s always tomorrow to get the best of me’). Only Take Back the Streets’ follows a different tack, taking as its theme a broader sense of uncertainty and emo-ish angst (‘the rises and falls/the rage inside keeps us alive’). 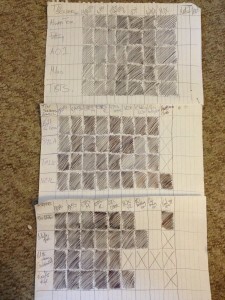 It’s all done with an intense mixture of heavy rock, US punk and nu-metal. Here, you’ll find traces of Muse, Porcupine Tree and Placebo alongside For Star Mary and Green Day. It’s a tight sound, a marriage of music and lyrics which only lets itself down with the rather lazy rhyming of ‘dreaming’ with…itself on ‘Always Tomorrow’ (all those times we never stopped dreaming/can I shout it out or am I still…’ well, you can fill in the rest. This, though, is a minor quibble. Within their genre of angst ridden rockers, these soldiers do exactly what they promise on their tin exterior. These particular warriors are winning the war and deserve a fair old mention in dispatches. Off the back of their debut record Telling Tales in 2010 Britain’s answer to the stadium filling anthem rock of the Foo Fighters are back with a new EP and it’s just as big as before. The Kent quartet’s latest is four slices of hook heavy pop-rock that does big on a budget. They’ve flirted with the limelight, but largely shied away from the success they’re quite clearly capable of garnering. With this EP, a precursor to their latest full length due later this year, they once again prove that riff heavy chorus led rock is alive and well this side of the pond. ‘Falling’ kicks things off with biting force and from there the pace never really lets up, sure ‘Take Back The Streets’ might be slower, but to think that means weaker is to completely miss the delights Tin Soldiers have to offer. Vocalist Rich Crossingham soars at every chance he gets (which is a lot) and these evocative in your face melodies are akin to some of Feeder’s finest moment, but with the tenacity of Dave Grohl’s smile. Relatively unknown, Tin Soldiers can only benefit from comparisons with these monoliths of modern rock and have come into their own enough musically to not be hindered. It’s bands like Tin Soldiers with tracks like the flighty ‘Always Tomorrow’ that will see stadium rock reclaim the charts and the public consciousness. The aforementioned song along with ‘Army Of One’ and really all the tracks here aren’t exactly beguiling in terms of lyrical content, “All eyes are on you now, like a scream inside that wants to get out,” as they often rely on cliché, but it’s so catchy that you can forgive them as you sing along anyway. Musically they bring out the big guns with Chris Persia’s drumming leading the way, but the tight and edgy axe-work from Matthew Wade is what really ignites this band. 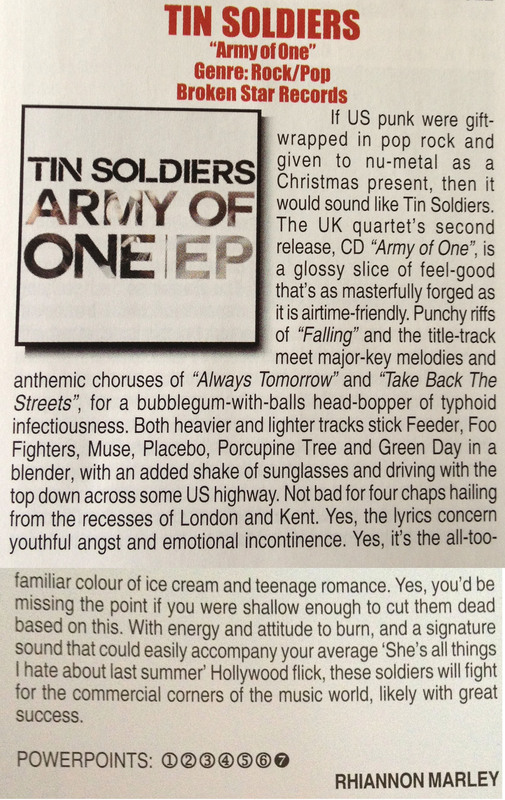 If you miss the jubilant naivety of Ash, the simple raw emotion of Feeder, and Muse now leave you, well bemused then Tin Soldiers are the band you’ve been waiting for. This is what your mother meant when she told you to go and have some good clean fun. The video story-line reflects the concept behind our second album. Future videos will expand upon this…..Check it out and let us know what you think. Yes!! We’ll be releasing our new EP in November. Featuring four new tracks, it will give a taste to whats coming on our second album!